Last night I watched Justice League with my young nephew. I spent my misbegotten youth reading comic books, so I love superhero movies. There've been some great ones lately--Wonder Woman and Black Panther. There've also been some really awful ones. Batman vs. Superman was abysmal, except for the five minutes when Wonder Woman showed up. 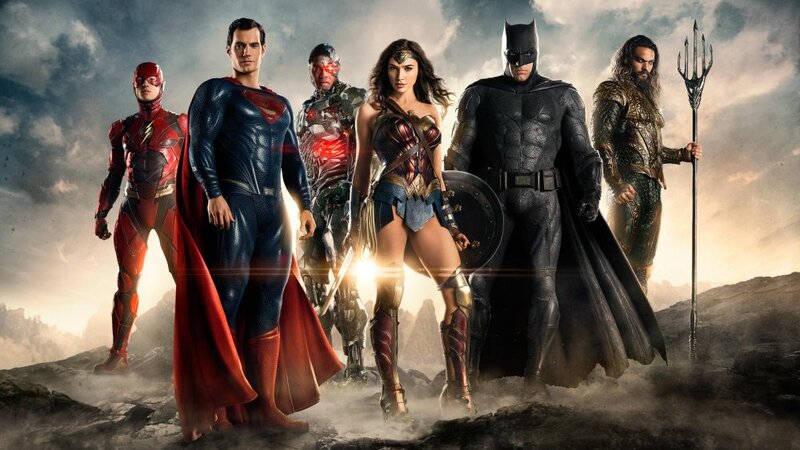 Justice League is really not very good. It tries to tell too many stories and introduce too many characters, and doesn't develop any of the new ones sufficiently. Superman returns from the dead and still has no evident personality. If we're gonna have an overweight Batman, it should probably be Kevin Smith instead of Ben Affleck. At least he'd be interesting to listen to. Gal Gadot as Wonder Woman is great, and the director often showed her face for no apparent reason, just so you could say, "Look, there's Wonder Woman." Nonetheless, as a UFT member, I was struck by the bad guy with the big horns. I don't remember if he had a name, but his goal was to put together three boxes of some kind of power and therefore create Unity. (Evidently no one had advised him that Al Shanker did that years ago.) Not only that, but he had an army of flying monkey/ insect creatures to support him. These creatures bled green slime when wounded, and there was more than one scene of superheroes being slimed by them upon their demise. The thing about the flying monkeys was that they had no loyalty. They may or may not have signed loyalty oaths, but once they smelled fear on the guy with the big horns, they were ready to turn on him with no hesitation. This is problematic. I mean, think about all those people in Unity whose job it is to sit around and write lies about people like me. How many of them does it take to create a handout at the DA saying people who don't tow the party line are disloyal? If you can write lies about us, you can pretty much write lies about anyone. That's just one reason not to depend on people who lie. In a union, who or what merits your loyalty? If you're part of the Unity Caucus, you've signed an oath to support whatever positions the caucus supports. This opens up a world of free trips and patronage gigs. You might find yourself working after school giving advice on pensions of something. If you hit the jackpot, you might find yourself with a full time job in some office or other. You'd hope this would be by merit, but the primary qualification is signing away your opinions to the Unity Caucus. If you do that, you agree to support Common Core. You agree to support junk science evaluation. You agree to support the Danielson Rubric and oppose any reduction in observations until and unless UFT leadership does the same. In fact, despite vocal protests from a Unity Caucus member at the last Executive Board meeting, you agree to support the ATR. This is required, because it was part of the 2005 Contract, and you supported that too. So when you get up there and complain when we demand elected representation for the ATR we're supporting the ATR, you're being disingenuous. It wasn't us who supported it--it was you. You probably don't know that, because the likelihood of this coming up at Unity get-togethers hovers around nil. Now here's the thing--should the gravy train slow down, and should the budget call for fewer flying monkeys, someone's gotta go. Will they turn on leadership? Probably not. That would require independent thought, and that's something you need to suppress or avoid if you're gonna support punching the faces of anyone who opposes Common Core. Nonetheless, the problem is people who don't think things through suffer from lack of vision. It doesn't really matter whether you have no vision or have chosen to consciously shut it down. Regardless, you're just along for the ride and you aren't a leader. Thus you get people in positions of authority who observe Barack Obama pursuing the most anti-teacher agenda in history and they say, "Hey, let's unconditionally support this guy." You get people who look at Hillary Clinton's unwillingness to embrace universal health care, a living wage or affordable college. They decide, "Hey, let's support her way ahead of time. That guy Sanders is a wild-eyed fanatic, what with his crazy ideas about universal health care, a living wage, and affordable college." When Clinton stands in front of the AFT in Minnesota and declares we can learn a lot from public charter schools, whatever the hell they may be, these folks applaud. They lecture you online and to your face that you're crazy to support Sanders. "Remember McGovern in 72?" they ask. Yet even now, none of them are asking, "Remember Clinton in 2016?" You can love America without loving Trump. You can love the union without loving Mulgrew. You now face a turning point, though. Do you give up on America altogether? Aren't you part of it, and if Donald Trump is President, isn't that partially your fault? If you don't love UFT leadership, what are you going to do about it? Are you going to quit the union and say screw everyone else, I'm keeping my 1400 bucks? That'll certainly weaken union, us, and make the Koch Brothers happy with a job well done. Of course, if I were running the union, I'd want to reach out to rank and file. I'd want to show them that I'm listening. Instead, we get the same old imperious nonsense, sitting up on their 14th floor Mount Olympus looking down upon us as though their omniscience were beyond question. High schools? They voted the wrong way. Screw high schools. The ATR? They're lucky to have a job. Screw the ATR. Class sizes? We negotiated them 50 years ago and that should be good enough for anyone. I believe in union. I will work to maintain it. But this isn't a one-way street. UFT Unity owes us their ear. While they may be totally unfamiliar with this concept, it's their job to represent us, not to do any damn thing they feel like and send flying monkeys out to tell us why they are right and we are wrong. UFT leadership has woken up to the fact that, due to their utter failure (among others) to mobilize the electorate, we are in crisis. But they've still failed to take even baby steps toward doing what their prime directive ought to be--listening to their members. If I were them, I'd be taking serious stock of how to do that. Otherwise teachers will have to wait for members to rise up on their own a la West Virginia or Oklahoma. Given the culture of complacency that has three of four UFT members failing to even vote in union elections, that could take years, decades, or centuries. We haven't got that kind of time anymore.